We called them streaks when we saw them at York Station, impatient to be on the way to Edinburgh Waverley Station, or Kings Cross in London. 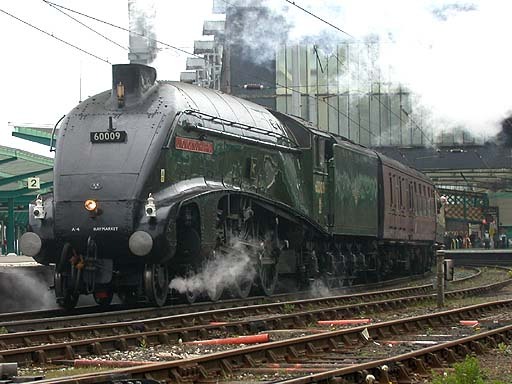 The image of a raging bull stamping its feet and snorting is one that always reminds me of these magnificent locomotives. 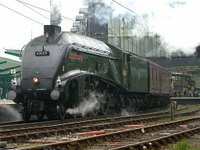 Housed at places like Doncaster, where I once saw a row of them, they mainly plied their trade out of London, through Peterborough and York, on their way to Newcastle Upon Tyne and the Scottish capital, Edinburgh. At Waverley Station, which is all but hidden in the valley that slopes down from Princes Street and the Scott Memorial, ‘streaks’ would send columns of steam high into the air, putting pigeons and crows to flight, and disturbing people sitting reading newspapers on benches nearby. At York, they would stand while passengers alighted to investigate the Roman city outside. Others would step into liveried carriages to be taken post haste to the bustling capital to the south. 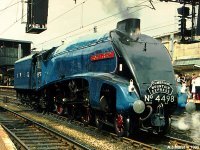 ‘Mallard’ still holds the record for the fastest speed attained by a steam locomotive, a startling 123 mph. Its streamlined boiler would have certainly helped. How do we treat the old lady?